Dishing on his eleven seasons as Boston’s most eligible bartender, Danson confessed that he was, at the time, almost comically unsuited to the role of Sam “Mayday” Malone, since he never frequented bars and was most un-Sammy-like when it came to romance. Telling Meyers that he went to bartending school in order to add some verisimilitude to his work behind the bar, Danson revealed that it was a waste of time, since the creators of the show cared more about the jokes than the mixology. Plus, nobody at Cheers ordered much except beer. 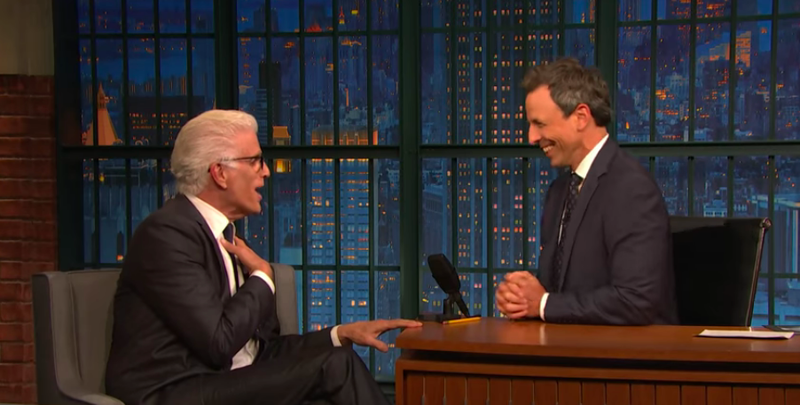 Danson—who went out for tequila with wife Mary Steenburgen after ditching the most recent Emmys immediately after losing to Bill Hader—told Meyers that his old Boston butterflies kicked in as soon as he stepped behind the bar once again. “I was full of insecurity and felt horrible,” confided Danson shockingly, considering the naturalness with which Michael made Eleanor—and us—feel, well, like he was glad she came.